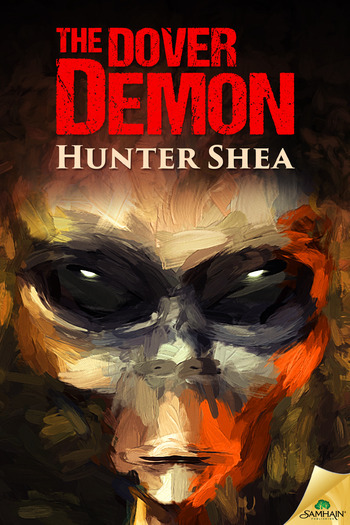 The Dover Demon/Hunter Shea Publicity Page | Oh, for the HOOK of a BOOK! Welcome to the publicity page for Dover Demon (Pub: Sept. 1, 2015, Samhain) by Hunter Shea, created and managed by Erin Al-Mehairi and Tim Busbey of Addison’s Compass Public Relations and Hook of Book Media and Publicity. We are so glad you’ve stopped by, but be sure to pop in periodically for news and updates ongoing! The horror book tour stop schedule will be updated BELOW each day. A trip Hunter Shea made to the International Cryptozoology Museum in Portland, Maine two years ago sparked the idea for THE DOVER DEMON. While he was there, he met famed cryptozoologist, Loren Coleman and talked about creatures he’s personally investigated. It turns out, he was the man on the scene in Dover, MA in the late 70s when the uber strange biped was spotted by several people over the course of two nights in April, Hunter reported. He also gave it its name of Dover Demon. Now, Hunter’s fictional world of The Dover Demon has been published as a novel and he was able to go back to the museum of cryptids in August and have a launch party for the book with Loren Coleman! To read more about that and see photos, head over to his site to read the ARTICLE and learn more all about it. Hunter Shea is the author of the novels The Montauk Monster, Tortures of the Damned, Sinister Entity, Forest of Shadows, Swamp Monster Massacre, Evil Eternal, and The Dover Demon. His stories have appeared in numerous magazines, including Dark Moon Digest, Morpheus Tales, and the Cemetery Dance anthology, Shocklines : Fresh Voices in Terror. He’s currently working on or completed a few more manuscripts set to come. His obsession with all things horrific has led him to real life exploration of the paranormal, interviews with exorcists and other things that would keep most people awake with the lights on. Hunter is proud to be be one half of the Monster Men video podcast, along with his partner in crime, Jack Campisi. It is one of the most watched horror video podcasts in the world. Monster Men is a light hearted approach to dark subjects. Hunter and Jack explore real life hauntings, monsters, movies, books and everything under the horror sun. They often interview authors, cryptid and ghost hunters, directors, and anyone else living in the horror lane. He lives in New York with his family and vindictive cat. He waits with Biblical patience for the Mets to win a World Series. You can read about his latest travails and communicate with him at www.huntershea.com or find him on Facebook and Twitter. 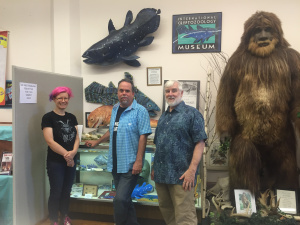 Pictured: Hunter at the Cryptozoology Museum in Maine with Loren Coleman. On this tour, win one signed print copy of The Dover Demon if you are in the U.S.! Just sign-up at the Rafflecopter link HERE!!!!! Hunter Shea’s other summer smash hit, Tortures of the Damned, was featured in Fangoria magazine. He’s giving away 2 signed copies of that Fangoria. How do you win? Anyone who signs up for Dark Hunter Newsletter between now and September 28th and lives in the U.S. is eligible. Already signed up? Refer a friend and if they win, grab it from their mailbox.